I've had this awkward space above our living room TV (which mind you sits at an awkward angle cause Blake insisted on there being NO glare on our tv from the window-insert eye rolling emoji here, ha!) that I've been searching for the perfect piece for! We had a West Elm faux taxidermy giant deer head up there, but I'm kinda out of the animal head phase if I'm being honest. So, I decided to dig up my rusty craft supplies and get to work! I knew this way I'd be able to create the perfect sized piece with just the right amount of boho! 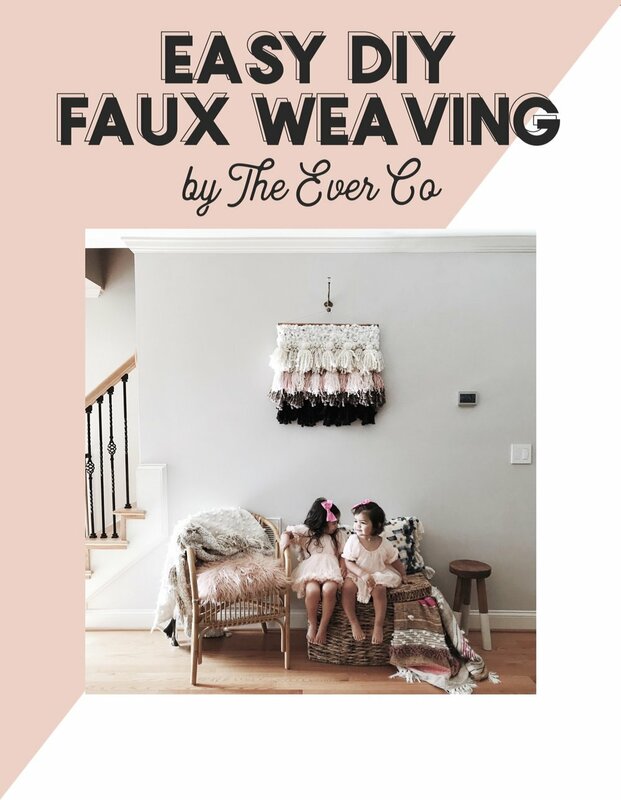 I began looking online at different DIY faux weaving tutorials cause I was not excited to build a weaving kit and spend days working on a weaving project. Luckily, I stumbled across the BEST tutorial from A Beautiful Mess, and I just tweaked their tutorial a bit to come up with my own! And guess what?!?!? I had EVERYTHING in my home already, spent a total of 3 HOURS making it, used about $20 of craft supplies and never left the comfort of my living room! The best part about this tutorial is you can literally customize the size, color and texture to fit any space in your home that needs a little update! STEP 1 : GATHER SUPPLIES. yarn for tassels (I have sooo much yarn in my craft room and I just grabbed the colors I knew I wanted to use to match our living room, which is generally neutral with a touch of pink). I also suggest using the thick chunky yarn cause it looks very chic, has a more "store bought" look, it's cozy AND it's easier to do cause it's so thick! It also adds so much texture! a rug (like in their tutorial) or anything that's a solid color that has some firmness to it to act as the backdrop. You can also use a latch hook mat if you'd rather tie than use hot glue guns. I actually used a hard piece of particle board for mine cause it was the perfect size! wooden dowel rod (like they used) or I LOVE using copper rods from Home Depot or Lowes! I love the mid century modern look the copper gives! Also some string or wire to hang the weaving. wall anchor or a pretty hook (I got ours from Hobby Lobby and love that it adds some dimension)! Here's our sweet Bella who would NOT get off the comfy yarn hahaha! STEP 2 : MAKE TASSELS. For the size of my art, which was roughly 3 feet x 2 feet, I made about 40 tassels, but remember I also used very chunky thick yarn. For thinner yarns with less volume, you'll likely need upwards of 70 tassels. This also depends on how big you want your piece. The tassels are the most time consuming part, but even so it only took me about 2 hours to make! I just binged Netflix with the hubs and listened to him make fun of me for spending so much time making "shag rugs for the wall." ahhahah! We had a blast lol. You can see the A Beautiful Mess tutorial here, but I will do a tassel tutorial soon! I feel like I've mastered them and will share a video as soon as I can! This is also a great time to figure out the color layout of your tassels and if you'll have enough for the space you're wanting to fill. STEP 3 : GLUE TASSELS TO THE BACKDROP. This parts so fun! This is when all of the time you spent on making the tassels finally pays off and you get to see your weaving come to life! I can't wait to see the creations you come up with! Tips: Make sure you spread out the tassels on the bottom layer, because the layers above them will "fill in dead space". My suggestion is to spread out the tassels on the backdrop and if there's too much dead space you may need to make more tassels. I ended up filling in a few areas at the end of the project. It's easier to go back in and fill in spaces than to not have enough yarn, so start out wider and fill in as needed. Does that make sense at all? Ha!! You'll only have to glue the top "ball" portion of the tassel. Everything else on it will hang loosely. STEP 4 : GLUE TOP FAUX WEAVING. This part may take a few tries, but essentially you will either glue the felt balls down (like in their tutorial) or use chunky weaving and puff it up randomly to make a "weaving" look. It's really hard to explain in words, so hopefully this pictures shows you what I mean haha! STEP 5 : SECURE ROD AND STRING TO TOP. Here's a closer look at the copper rod I used at the top of mine. Again, just hot glued it to the particle board! I then had Blake drill two holes on the sides of the weaving and I strung heavy copper electrical wire to the art! And here's the finished piece! I hung it in another spot to get a good picture of it with the girls, so you can see it styled a couple different ways! Andddd...here she is in her new home!!! I absolutely love it and keep smiling at it every single time I pass it. It's also the very first thing we see as we walk down the stairs in the morning!